← Is Mitt(wit) Romney A Liar, Stupid or Both? This week’s episode of “Republicans Eating Their Own” features likely GOP Presidential nominee Willard M. Romney. Are you folks familiar with the “Birthers”? Surely you must remember them. They are the folks like once-and-future GOP Presidential candidate Donald Trump, lawyer/dentist/realtor Orly Taitz, nutjob Maricopa County Arizona Sheriff Joe Arpaio and about 75% of Tea Party members. As you will recall, these folks do not believe that President Barack Obama was born in the United States despite all proof to the contrary and not a scintilla of credible evidence to support their allegation. Indeed, as recently as this week the anti-Obama Birther movement re-emerged when Republican U.S. Rep. Vicky Hartzler (MO) said she “doubts” that the birth certificate produced by President Obama is legitimate. To their credit however, we have just learned that The Birthers are equal opportunity accusers. The Los Angeles Times reports that a group of minor party candidates and conspiracy theorists have sued California Secretary of State Debra Bowen to demand that she verify and/or address “questions concerning the eligibility” of Mitt Romney to vie for the role of commander in chief. The law suit was commenced by Republican write-in candidate John Albert Dummett, Jr., and Markham Robinson, the chairman of the American Independent Party of California, among other politicians and voters. The U.S. Constitution of course, requires the President to be U.S. born and at least 35 years of age. MSN.com reports that one Birther explains that Romney’s citizenship is up for debate because his dad was born in Mexico. That is correct, Mitt Romney’s father was born in the Mexican colony that Mitt’s great-grandfather founded after fleeing the United States so he could stay married to Romney’s four great-grandmothers. Folks are now wondering if Mitt was, in fact, born in his father’s foreign homeland. Of course, this also brings up the the fact that Mitt’s father George Romney was not eligible to serve as President when he ran for the Republican nomination in 1968. Where was all the conservative right-wing outrage then? We can only wonder if Trump, Taitz, Arpaio and the Tea Baggers will take the same interest in Mitt Romney’s place of birth as they have with that of Barack Obama. Stay tuned. Same moon-bat channel. Same moon-bat time (obscure 1960’s “Batman” television series reference for those of you under the age of 45). Posted on April 10, 2012, in Mitt Romney and tagged Birthers, Donald trump, Joe Arpaio, Mitt Romney, Orly Taitz, Tea Party, Tea-Baggers, Vicky Hartzler. Bookmark the permalink. 6 Comments. The part where his father ran stunned me. How can you be so delusional to think born in Mexico would work? Thing is, it never even became an issue when his father was running. What-up with that? Willard the (cultish) anchor baby? Whoever made that is pure genius!!! 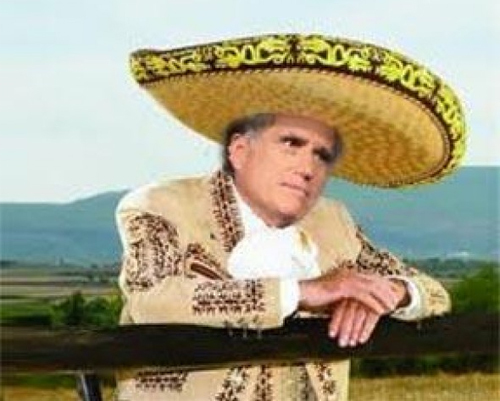 Mitt Romney’s Mexican father, hmmmmm…….Are the simple minded “BIRTHERS”, going to ask Romney for his birth certificate? We all know this was never about a birth certificate, if it was then these same people would be asking Romney for his. It’s about small minded people who hate African Americans and do not have the brains to review a President’s policy so they make something up. Lets be clear none of these dullards have won a case in the “U.S. Courts”, maybe in theirr simple minds (if they have any) but not in our “U.S. Courts”, so unless Birthers/ teabaggers, whatever you want to be called, win a court case, “We The People” will continue to see as dullards, liars or racist or maybe all three. Deal with that baby!